Michter's US1 Barrel Strength Kentucky Straight Rye. Courtesy Michter's Distillery. Editor’s Note: This series is intended to showcase the stories of interesting bottles, new and old, that cross our glassware. The opinions expressed are those of the authors, and do not necessarily reflect the palates of the rest of the staff. The first time I tasted some Michter’s whiskey straight from the barrel was a cold, late winter morning in early 2018. At the Shively Distillery on the outskirts of Louisville, Pam Heilmann and Andrea Wilson were leading a group of us through tours of the facility, where Michter’s whiskey was being aged, barreled, and distilled. As we gathered in the dumping room, distillery workers had rolled a mature barrel over the trough, and we watched as its contents dumped in gurgling spurts, jetting hard liquor and black chips of barrel char into the metal grates below. We lined up like eager schoolchildren, preparing for a trip to the playground, and one by one we stuck clean tasting glasses under the brown deluge, most of us overfilling our glasses—some of us on purpose. Held to the sun, the whiskey was a dark amber color, with bits of char rocking on the bottom of the glass as tiny tides swept them back and forth. At that point in the morning, with a single breakfast cocktail under my belt (it was a Friday don’t judge me), the unfiltered whiskey was powerfully raw, bright, oily, and it clung to the corners of my mouth. It was hot—barrel strength, after all—but the heat quickly subsided, revealing layers of sugar flavors, depths of cool oak and vanilla character, and an aromatic vapor that was thick in my sinuses, and warm as I blew it out through my nostrils. It was warming on that cold day. That exhale—the one after my first swallow—left a long lingering finish with decadent flavors. It was like rich caramel over creamed corn, and a dry, spicy wave of rye’s earthy, domineering character at the climax. It needed water—something to rescue my tongue from the growing intensity of that burning sensation from the high alcohol (probably 112 or more). And the burning continued, because I couldn’t stop myself from taking sip after sip. I had had whiskey straight from the barrel before, but as I subtly slipped the half full glass up my jacket sleeve to bring it along for the tour well beyond where it was permitted (sorry, Pam), I realized this was a different experience. The whiskey in that glass wasn’t 25 years old, nor was it the $5,000 Celebration Michter’s is also known for. It was just an average barrel. The questions that followed that morning and in the weeks following led me down a long, nerdy rabbit hole about chill filtration. I’ll spare you the details, but I came out on the other side with a new understanding of a part of whiskey making that isn’t much talked about. There’s a reason I’m telling this story. A couple of weeks ago, Michter’s released the newest version of their single barrel Barrel Strength Kentucky Straight Rye. At $75 a bottle, it’s one of the pricier whiskeys released this year when you eliminate bottles with special cask finishes, and bottles with official age statements. He’s right, and to the people who would cry foul over pricing or whatever irks them today: this bottle is worth every penny. Michter’s Barrel Strength Rye is, but for a few swimming shards of blackened oak, a perfect recreation of that experience. It’s heady and grain forward, with deeper flavors—a bourbon lover’s rye, to be sure. My bottle is a third empty, only because I’ve had too little self control to remove it from the tasting pile at my desk—just to be sure it’s that good. It has those deep, baritone sweetnesses, the brighter, more floral high notes. It’s a complete package. At 109.8 proof (the average is 110.8 across the limited release, but remember: single barrels) this needs no water, though a couple of drops did add new layers to one tasting. But honestly, that was a few days ago. I’ve had this whiskey nearly every day for a week, and time and again it impresses me. 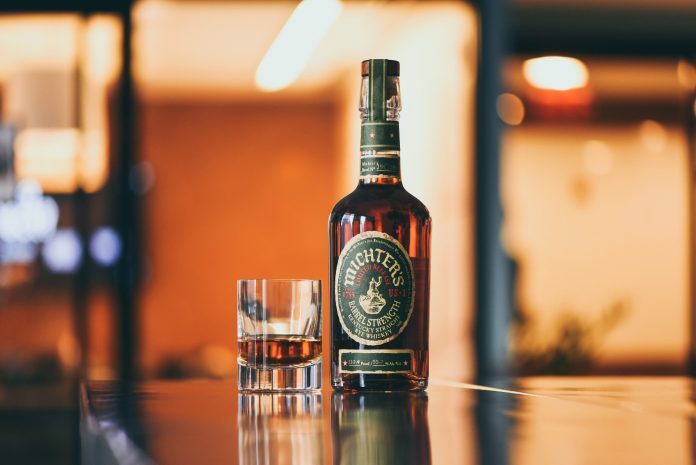 Limited release Michter’s bottles are already notoriously difficult to find, but if you come across one of these, on the bar on in a store, treat yourself. It’s the closest thing I’ve found to drinking whiskey straight from the barrel.